She is a well-known name in the blogging world. Greatly admired for her witty writing on a wide range of topics related to life and family, and deeply respected for her sagely scripting on several sensitive topics related to society and culture. Yes, I am speaking of the one who has the uncanny ability to ‘cyber-nag’ with such politeness and kindness that as a reader you end up seeking more of her nagging because you know it isn’t nagging at all. Then what is it? It is the unique scent of her deep personal wisdom acquired as a result of life-experience and the quintessential charm of her incomparable expression that is steeped in her love for the written word and the inspiration behind it, as well as for the reader who is bound to be touched by her words and the thought behind it. Zephyr Nag has been blogging for many years now, but I ‘met’ her only a year ago. Yes, I know I have a lot to catch up on many great things on her blog. But I have already experienced many moments of awe and deep beauty during every visit to her blog. One particular post of hers, titled “Coming Full Circle” touched me deeply. It was originally published on her blog more than two years ago. I have read it a few times now, and every time I read it I feel she is telling not only a personal story but through her story is speaking of a phenomenon widely seen and experienced. Perhaps it is so because there is a deep psychological truth behind the ‘circular’ journey that she describes. Another important insight that reveals itself in Zephyr’s sincere and heartfelt account of her personal journey to arrive at a more subjective, inward-oriented approach to religion has to do with the different possibilities of the interaction and intersection between Reason and Religion. Of course, here we are speaking of the real essence of religion, not the crude and infra-rational religionism, though in the larger evolutionary march, both for an individual and a society, everything serves a purpose. There can be no hope for anything supra-rational unless one has passed through infra-rational and rational stages. “The deepest heart, the inmost essence of religion, apart from its outward machinery of creed, cult, ceremony and symbol, is the search for God and the finding of God. Its aspiration is to discover the Infinite, the Absolute, the One, the Divine, who is all these things and yet no abstraction but a Being. Its work is a sincere living out of the true and intimate relations between man and God, relations of unity, relations of difference, relations of an illuminated knowledge, an ecstatic love and delight, an absolute surrender and service, a casting of every part of our existence out of its normal status into an uprush of man towards the Divine and a descent of the Divine into man. All this has nothing to do with the realm of reason or its normal activities; its aim, its sphere, its process is suprarational. “But there is another level of the religious life in which reason might seem justified in interfering more independently and entitled to assume a superior role. One of my all-time favourite Hindi movies is Guide. I have watched this movie countless times (yes, I have read R. K. Narayan‘s novel too, but this is one of those rare cases where I think the film is better than the novel). And every time I tear up during the scene when the simple and deeply faithful village headman tells Raju guide, whom the villagers think of as some sadhu or saint, that roads to reach the God are often highly zig-zag and therefore beyond our comprehension. What a profound truth, stated so simply! It is really this zig-zag of life that shows us our path to the Divine. Zephyr’s journey of ‘coming full circle’ speaks of one such zig-zag experience of life. 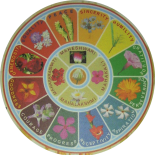 I am absolutely thrilled to re-blog her article on Matriwords, and I am indeed grateful to her for giving me full freedom to re-present this circular journey as I ‘see’ it in the light of the Truth that I find in Sri Aurobindo’s vision and work. What I find most fascinating in her account — from an academic point of view, which is why it fits in with the ‘research’ focus of Matriwords is this: it presents both a seeker’s personal journey and at the same time speaks of something that is quite widely prevalent in our times, almost like a trend of modern mentality that first questions, rejects and gradually discovers some subjective truth within which opens up a whole new path of seeking. Of course, many (perhaps the majority) are stuck at the questioning/rejecting phase. And that’s the beauty of her narrative – it speaks of the “full circle” as she calls it. There is so much to ponder and reflect upon in Zephyr’s article, particularly toward the end where she lists her key insights (about Hinduism, about secularism and many other topics) that each of those points can become an opportunity for deep thinking and analysis. At first I was tempted to do that kind of analysis but then wisdom intervened (thankfully) and I decided to let her words speak for themselves. Something about the inner truths hidden in Zephyr’s journey (and its account coming from a deeper place within her) stopped me from adding any of my interpretive voice. Yet, the personal truths she speaks of seem like a perfect demonstration of the universal truths and wisdom contained in some of Sri Aurobindo’s deeply sublime aphorisms, coming from a supra-rational height of spiritual realisation. The two kinds of truths seem so ‘made for each other’, as the readers will notice from the re-presentation below. Sri Aurobindo’s voluminous works on philosophy, yoga, poetry, culture, society and politics are indeed incomparable and written from supra-rational heights of consciousness. And so is his extremely insightful and deeply spiritual collection of aphorisms, each of which is an opportunity and invitation for deep contemplation and meditation. In this re-presentation, while I keep Zephyr’s words and expression intact selected aphorisms from Sri Aurobindo have been inserted to help bring out the essence of Zephyr’s thought and make her individual experience more universally relevant (as per my understanding). So without further ado, I re-present here Zephyr’s journey of “Coming Full Circle” as I see it. Thank you, Zephyr for writing this piece, and for allowing me to showcase this here on Matriwords in this three-part series. When I hear the oft repeated assertion that one is an atheist or an agnostic, I am reminded of my own turbulent brushes with faith over the decades and wonder if they have arrived at the conclusion after careful study or on impulse. My own journey of faith has been an eventful, sometimes painful and at other times exhilarating, going all the way from implicit faith, to skepticism and rebellion, to questions and arguments, to an extended period of agnostic theism, and to implicit faith yet again. Though I believe that one’s faith is personal and not meant for discussion or dissection, I wanted to share this special journey. Maybe it will help someone out there. Thank you so much dear Beloo, for turning an ordinary post into something much deeper with your comments and also the very exalting spiritual thoughts culled from Sri Aurobindo’s works. Reading them makes me feel that I have yet to climb the very first step, and yet gives a feeling of exhilaration at the possibilities glimpsing higher truths than I am aware of at the moment. As you have said, his words come from a suprarational consciousness and it will take a lot of learning before I can begin comprehending the deeper meaning behind them. O my dear Zephyr, reading your post helped me go deeper into the words of Sri Aurobindo, especially the ones I have shared here and plan to share in the next two parts of this series. In a way, your words help ‘illustrate’ in a very personal way what Sri Aurobindo speaks of in philosophical terms. I sincerely hope and pray that our readers will also get to taste the nectar that this synthesis creates. As for your request, I will email you a short PPT and some notes in a few days. Maybe after Thursday. Beloo – The thing about all of your posts is that there is something or the other I get to know/learn. Sometimes, I find the posts hard to understand cos of their spiritual nature or my lack of intellect but there is something valuable for a reader like me. Thanks Parul for your kind words. Cyber nag’s blog space is something you will enjoy quite a lot! “God’s negations are as useful to us as His afﬁrmations. It is He who as the Atheist denies His own existence for the better perfecting of human knowledge. It is not enough to see God in Christ & Ramakrishna & hear His words, we must see Him and hear Him also in Huxley & Haeckel.” – I had never thought about faith and atheism in this way, and I too (like Zephyr) have gone through a lot of “phases” in terms of the depth and sanctity of my faith. Great to hear this, Shantala! I am glad this particular quote about atheism spoke to you. Part 2 is now up, hope you will find that one also thought-provoking! This post talks to me and here I am with my limited intellect trying to decipher the meaning, with great effort. I read one of Swami Vivekanand’s book based on his speeches a few years back. The essence of that book is on the similar lines as mentioned in the first para, you included here, from Sri Auruobindo’s book and this gave me the impetus to begin on my spiritual journey. It kind of affirmated my lack of acceptability of the religious rituals which I felt were not doing any good for me. I got to know that the religious rituals are just the first step to the goal of attaining spirituality but which I found were more of a limiting circle. Therefore I thought if I can straight away get to the spiritual path then I don’t really need the first step. However if one believes and practices something which is not a common belief then that person is subject of being detested and for this reason I have never till now talked about my thought process in this direction. I feel grateful to you for having visited my blog and opening up my windows to your insights. Thank you Beloo. Happy to have you here, Anamika! Welcome to Matriwords. Thanks for sharing your perspective and experience. I guess this whole inner journey is so individualised that no single formula can work for anyone. For some people rituals can be a great aid and support, for others there may be other means to help concentrate. On some level we all need some kind of ritual to provide some sort of structure to our practices – religious or otherwise. I feel it is a mistake to let societal perceptions of anything colour or bias our own emerging view of our inner requirements. Modern minds have difficulty accepting the deep inherent value of outer religious practices, but if we start researching and in-searching (the latter being more important), we find that often the outer activity becomes the means to slowly go inward. Provided the outer act is done with as much sincerity and devotion as we can muster, and not just as a mechanical thing. That’s why perhaps almost all spiritual paths encourage some type of discipline – whether it is some form of puja, meditation, japa, chanting, etc. In our culture, even those who are sincere sadhaks of music, painting, dance or any other art go through serious discipline. Rituals often help with the disciplining of body and mind. But like with everything else on the spiritual path, in this also there can be no universal rule. Freedom is the key. This reply has answered some of my questions sent to you. Thank you so much! wowo.. right first of all my intellectual level is not that high , so it takes me a bit longer to understand and even then i dont understand much ..
Maybe somethings are meant to be ‘understood’ by heart 🙂 And I suppose if one has an open mind and heart, the high or not-so-high intellectual training doesn’t matter much. Thank you for stopping by. I am happy to hear that you had a chance to meet Zephyr Nag. I hope to meet her some day! Thank you, Monica for sharing such a wonderful perspective. Yes, if we can somehow get to the essence of another person’s experience we can begin to not only empathize but also connect with it on a deeper level. That’s what I get from your comment here. And thanks for also sharing a bit about your journey. It is heartening to see how Zephyr’s words help us all to look inwards. Being from Pondicherry myself and having heard some of Aurobindo’s wisdom (from my father), I could connect with this post. I believe most of us go through a turbulent journey of faith where our beliefs and perspectives change more than once. I myself am in one such journey. A wonderful start and am on my way to reading the other two parts. I have been reading Zephyr for quite a while and she is an absolute delight. Beloo… I really loved your introduction to Zephyr. Very heartfelt and beautiful. Thank you for sharing your thoughts. I am glad this post spoke to you. Also happy to know about your Pondicherry connection! I agree with what you say about the nature of our inner journeys. That’s the real significance of Zephyr’s post, in the sense that her words take us to a place where we are compelled to reflect on our own journey of faith. I also agree it is indeed a delight to read Zephyr. I am so happy I could feature this very special posst of hers on this space. Hope to see you again on matriwords! Zephyr is incredible. She can write about anything and everything whole heartedly. That is the reason her post touch our hearts. Oh yes, Zephyr is a wonderful writer! Welcome to matriwords, Sandhya. Good to connect. This entry was posted on January 11, 2016 by Beloo Mehra in Guest Post, India, Spirituality and tagged Indian Culture, Spirituality in Life.